The rise of private transit operators like Bridj, Leap, and Uberpool has raised questions about equity in places including the Bay Area, where such services are fast replicating. A related issue is the impact they will have on traditional public transit systems. 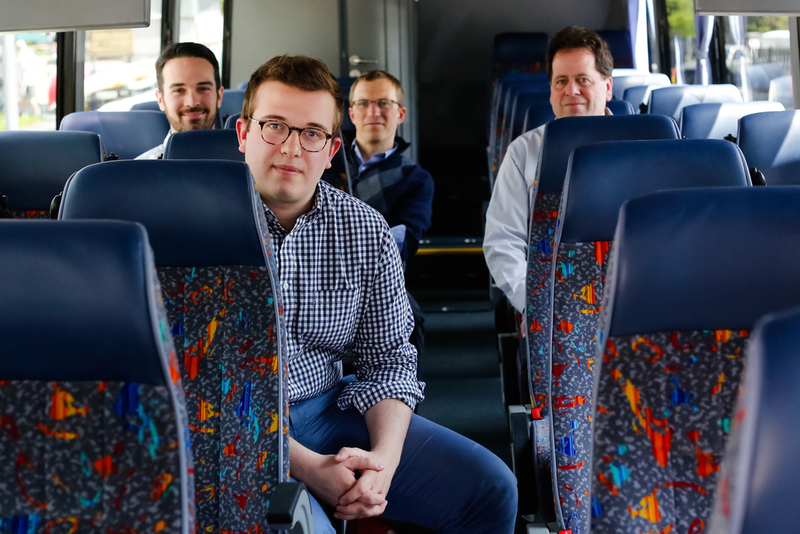 Private transit vehicles have been described as “like a lounge on wheels,” with amenities like leather seats, refreshments, and Wi-Fi for those who are willing and able to pay. Jarrett Walker, a transit consultant who blogs at Human Transit, says he thinks the ultimate impact — good or bad — depends on a few factors. If microtransit co-ordinates with conventional big-vehicle transit, we get (a) lower overall Vehicle Miles Traveled, emissions, and congestion, and (b) stronger cases for transit-oriented land use and thus (c) better, more humane and inclusive cities. If they compete with it, drawing away customers from big vehicles into smaller ones, we get the opposite. If it were a fair fight, high-volume urban transit (not just rapid transit but also high-volume frequent local bus lines) would continue to prevail where it’s the best use of both labor and scarce urban space. My fear is that it’s going to be an unfair fight, one that’s only made worse when the media frame it as ‘little enterprising’ upstarts vs ‘big, old’ agencies. In such an unfair fight, the upstarts can too easily win through means that are destructive to justice and the environment (low wage “contractors”, replacing space-efficient big vehicles with smaller ones) rather than through finding the most efficient equilibrium for all the transport needs of a city. Elsewhere on the Network today: The Wash Cycle pushes back against the notion that rides per bike is the best way to measure the success of bike-share systems. Bike Walk Lee reports that while no one is paying attention, southwest Florida is making big strides on sustainable transportation. And Streets.mn critiques Minnesota’s habit of removing crosswalks. Last I checked it’s reasonably inexpensive to make accommodations for people with wheelchairs to get around on surface streets. The curb cuts benefit people with strollers, too. They also benefit me when I’m pushing a shopping cart, or riding my bike from the street onto the sidewalk. That’s the key. Low cost measures which also incidentally benefit a wider segment of the population are good. Same thing with level boarding for buses or access ramps. People lugging around heavy luggage certainly appreciate those. Yes, research to cure handicaps versus accommodations isn’t an either/or proposition but which do you think is getting a lot more money? Why should the medical system have an incentive to cure these disabilities when it makes so much money now off handicapped aids, visiting nurse services, etc. It’s sort of the same argument I put forth for cancer. Cancer is big business. The medical establishment has no real incentive to find a cure for it as it will hurt their bottom line. This is why somebody else needs to, preferably a heavily funded government research project. We are making halting progress but it’s much too slow. I don’t know if you’ve seen videos of paralyzed people able to move their limbs for the first time in years. It’s heartening. I really wish we would spend a lot more money on this. We also have lots of disabled veterans who might benefit. Er, you are way off base on the ” class” of people utilizing these new transportation services. Educate yourself. Joe, the local cities kept refusing to install curb cuts for decades; it’s been required since the Rehabilitation Act of 1973, but it just doesn’t happen unless they’re sued into compliance. The basic principle of the ADA is “when you are spending money buying new stuff *anyway*, make it accessible for the disbled”. They need to do that. Joe, on an off-topic matter, nobody will ever find a “cure for cancer”. I know enough biology to explain why. Basically, cancer is the natural and default state of all cells — we have a bunch of “cancer preventing” mechanisms (apoptosis promoters). The failure of any one of these mechanisms causes cancer. Or sometimes the cancer just gets past all the mechanisms. Each of these possible causes is a separate disease which needs a completely separate method of prevention & cure. Cancer isn’t one disease, it’s hundreds. It’s pretty easy to accomodate blind and deaf people, as well. We should do that too. Really, 99% of “disabled accomodation” is for mobility impairments, sight impairments, and hearing impairments. Add “don’t be a jerk to people with mental issues”. That covers nearly everyone. By the same token, I could say that rail is point to point and trucks aren’t. It all depends on where the roads and tracks are located; we just have a lot more roads and a lot fewer tracks nowadays.